Unfortunately I don't have a lot of time for the carbon work (I train a lot, education, girlfriend,.. ), but I really love the work and will for sure continue making some new custom components and of course test/ride them. My symbol is ..., and Berk is my surename. This topic is about a new frame. A birth of a new frame, called PROTO-TYPE 3. I already made 2 frames and some other components...the second frame (topic "Berk PROTO-TYPE 2") was really a big success for me. But I want to make it even better! It's sure possible, so that is also the reason that I'll make another road frame. I already know how to improve a few details and reduce the weight of the frame, with good stiffness! My aim is SUB 1000g. Hope you'll like it - any comments etc. are welcome! Last edited by Berk on Thu Sep 29, 2011 5:33 pm, edited 5 times in total. I have followed all of your builds and components that you have build and was wondering if Proto-Type 3 will incorporate a few of the items together. 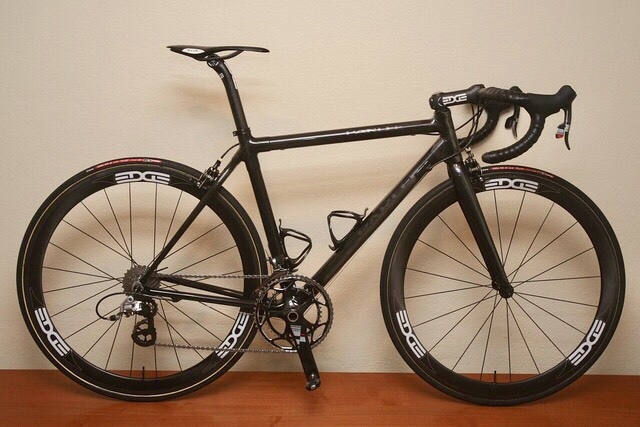 A sub 1000g frame will be the lightest you have build but is not super light. I was thinking since you know your saddle height very well at this point coming from a builder/racer background that you could probably build the saddle onto the ISP and save a lot of weight not having any mounting hardward for the post. You saddle/post combo is pretty light but imagine how much weight you could save if you built everything together. Just a thought. I really enjoyed your previous build threads and am looking forward to this one. Even more details about the assembly techniques would be appreciated. BmanX wrote: /...I was thinking since you know your saddle height very well at this point coming from a builder/racer background that you could probably build the saddle onto the ISP and save a lot of weight not having any mounting hardward for the post. You saddle/post combo is pretty light but imagine how much weight you could save if you built everything together. Just a thought. I also followed all your work and prototypes... really nice work and craftsmanship ... well done. I was with the impression that the new Prototype 3 would be a TT frame ... a WW is also welcomed ... keep up the good work!! Yes, I'm also already working on a TT frame, but for now only on paper...and yes, I will make one for sure! Will see about my free time, most likely during the summer. This frame (PROTO-TYPE 3) won't take me a lot of work time. Tomorrow I'll go on a training camp with my team (till 30 December) and after that I'll continue with the work. I already made the moulds for the tubes at the end of the season, and most of the tubes for this frame are already done! I'll use the same tube for the headtube and the downtube. The inside diameter is 44mm (for press-fit headsets) and the outside diameter is 47mm. I still have to precise cut the end of the tube and of course shape it (right angle and "groove"), that it will fit perfectly when I'll glue the tubes together... At the end the downtube should weight just under 160g. Also the BB will be for press-fit bearings (41mm), carbon fibre tube, 86.5mm wide. Will keep you updated. If possible also during my training-camp, because I already have "some news in stock"
I think you have a brilliant talent as a designer, craftsman and fabricator. Maybe you should start your own company or a consulting firm regardless of whatever else you choose to pursue as a career! Another great topic to follow. That would be really a dream job for me! Hopefully some day I'll manage to have my own small company. I have a lot of new ideas and innovations how I can make new components, I'm just waiting to have some free time to make the projects true. Cool! A Berk project again. I'm going to follow this for sure! This is it for today! Greetings from Pokljuka (Slovenia) where I have a training-camp with my team (till Friday). On 19.12 there was the biathlon world cup and it's really great to train here! Carbon fibre BB for press-fit bearings (41mm). Just the base tube, after the joint will be reinforced the tube should be cca. 3.5mm thick. When I'll come home I'll still have quite a lot of work to do...just can't wait! AWESOME just incredible work. I love your threads and would be honoured one day to own a bike from you.